Mark - My name is Mark Baumgartner, I work at the Woods Hole Oceanographic Institution in Massachusetts and I am a biological oceanographer. And if I were a critter, a marine critter, I'd be a North Atlantic right whale. The reason I would be a North Atlantic right whale is because I like to eat. And the job, the most important job of a right whale I think is eating. They eat a lot, they eat often. They have a funny way of eating. They have very large heads, and basically their mouth is a net and they catch plankton And the things that they feed on are about the size of a flea. And so they need to eat a lot. In fact, we estimate that they have to eat 1-2 billion of these creatures every day. These creatures are called copepods, they're little crustaceans, a lot like a crab or a lobster but much, much smaller, the size of a flea. So in terms of, so to put that in terms that we can understand that's about 3000 big macs, every day. Or the weight equivalent of a Volkswagen Beetle, in food every single day. So, I like to eat, right whales like to eat, that's great. In the ocean, it's eating or it's being eaten. And so size has a lot to do with whether you're going to get eaten or not. And for the whales they have very few predators because they're very large. So, as a whale you would be less prone to being eaten by anything but you'd get to eat all the time. So, that's not to say that right whales don't have problems. They have some serious conservation issues in the North Atlantic. 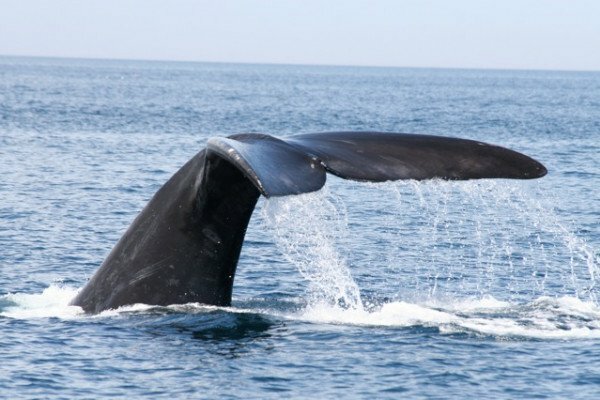 They tend to get hit by ships and get entangled in fishing gear and because their population is so seriously endangered, there's only about 400 right whales in the North Atlantic, this is a big problem for them. Just loosing one or two animals from the population, particularly females, is a big problem. So, life is not all fun and games for right whales, they have these interactions with right whales that tend to be not so good for them. But there's a lot of work being done on that front, there's a lot of good will on the part of the shipping industry, the fishing industry. It's pretty clear that there is a problem and people really want to solve the problem, and there's a lot of good people, both scientists, government scientists, policy-makers, and people from the industry that want to improve the prospects of North Atlantic right whales and there's been a lot of good work done, including moving shipping lanes and changes to fishing practices. So I think the outlook for right whales is actually quite good, the population has increased over the past decade. When I started studying right whales they used to say there's probably only about 300 whales and now there are 400 whales which is given me a lot of hope for the species.